A master of American folk music, Irish music, Scottish music—it doesn’t matter. A fine songwriter and one of my favorite singers.—Mark Knopfler. Tim O’Brien’s uncanny intersection of traditional and contemporary songwriting, dedication to a vast and ever-expanding array of instruments, and ongoing commitment to unique and challenging musical scenarios has earned him a key place in today’s thriving roots music scene. As a songwriter, O’Brien has a gift for finding the profound hiding within the mundane, and bringing it out in a way that is both casually conversational and deeply felt. 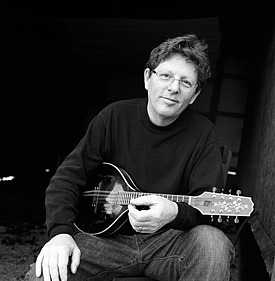 O’Brien’s influence – as a bandleader, songwriter, mentor, instrumentalist, or vocalist – is evidenced in the many recordings of his songs by the Dixie Chicks, Garth Brooks, Nickel Creek, New Grass Revival, and the Seldom Scene, as well as his recorded collaborations with Steve Martin, the Chieftains, and innumerable others. Most recently, O’Brien has been performing as part of Mark Knopfler’s band. O’Brien listens to bluegrass and hears the music’s roots in modal Irish ballads and vintage swing, reexamining those styles, and many others, in his own music. “Each time I go into the studio to make a new album, I could make an Irish record, or a bluegrass record, or a country record,” he says, “but it seems artificial to sift anything out. In the end, I just try to make it round.” Growing up in Wheeling, West Virginia, O’Brien was surrounded by classic country and bluegrass music, subsequently augmented by the revolutionary folk music the era, including Bob Dylan, whom O’Brien paid tribute to on the acclaimed 1996 release Red On Blonde. While his sister (and occasional collaborator) Mollie took piano lessons, O’Brien pursued guitar and banjo on his own, eventually adding mandolin and fiddle to his arsenal by the time he left for college. Dropping out after a year, O’Brien headed west, eventually settling in Boulder, Colorado, where a burgeoning, eccentric roots music scene was forming.